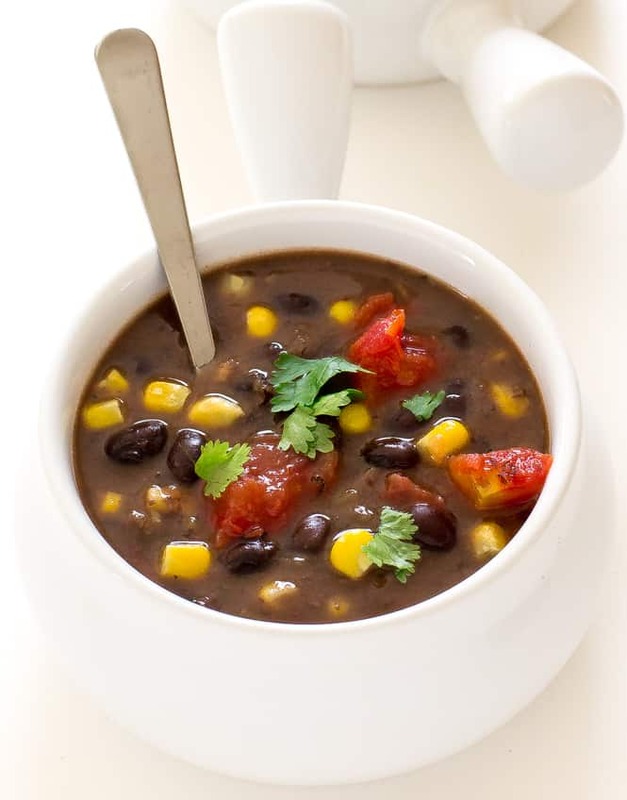 Super Easy 20 Minute Black Bean Soup! A hearty, filling vegetarian soup! Hi guys! It’s Kelley back from Chef Savvy! 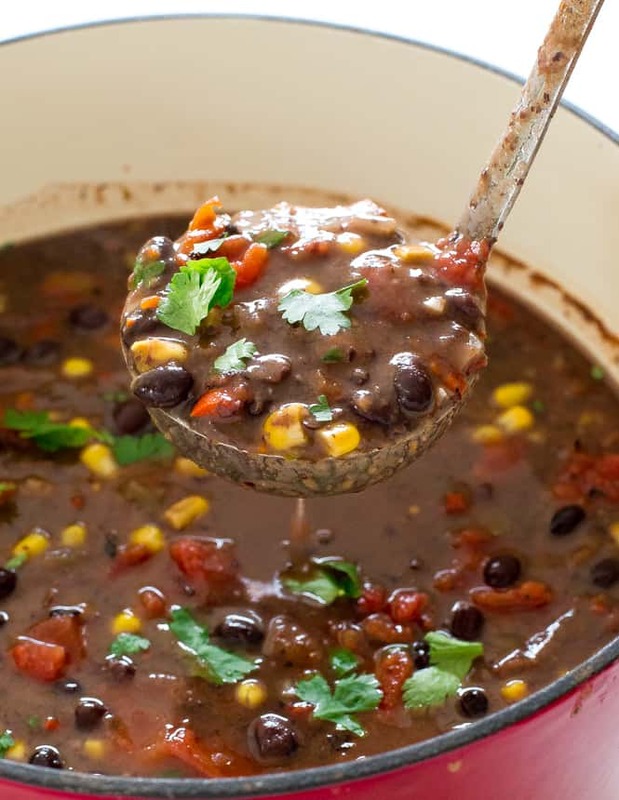 Today I am sharing with you my 20 Minute Black Bean Soup! 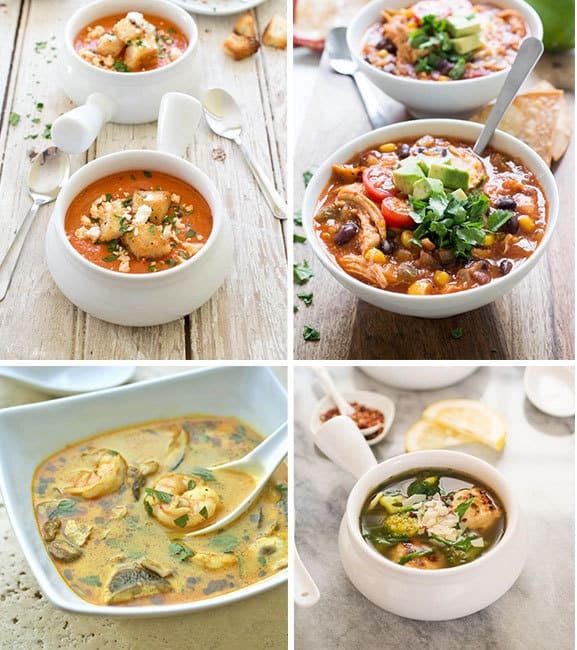 This soup is loaded with flavor, takes only 20 minutes to make and is vegetarian! 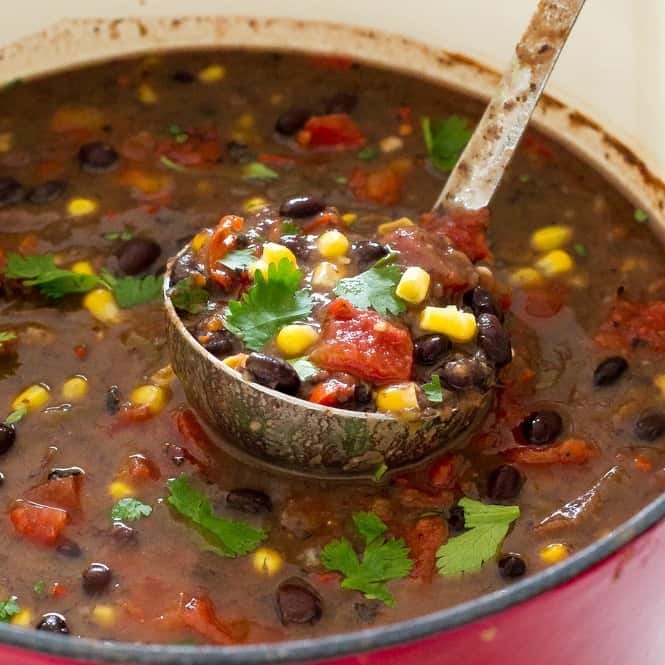 This soup is loaded with tons of black beans, corn, fire roasted tomatoes and cilantro. It’s a hearty, satisfying soup for the cold winter months. 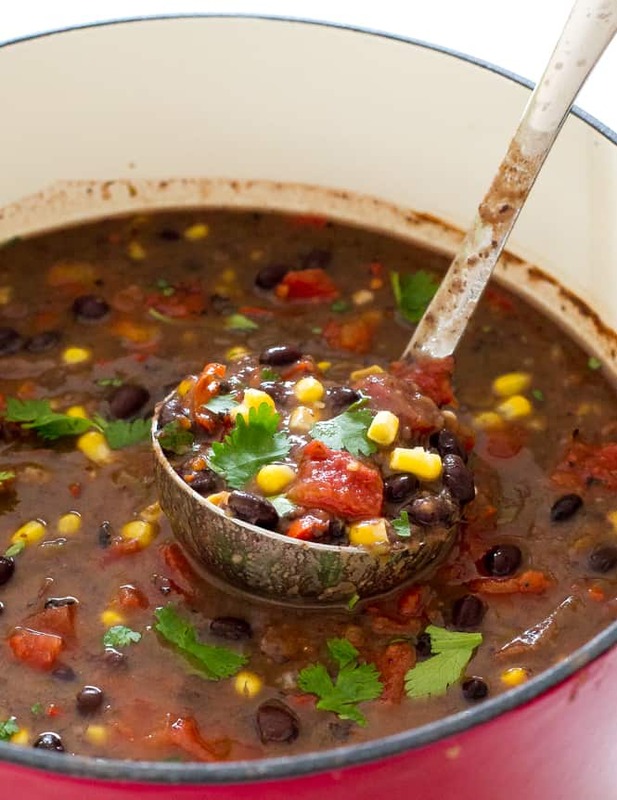 This 20 Minute Black Bean Soup is super easy to make. Simply sauté the onions and garlic and stir in the rest of the ingredients. Let simmer for 10-15 minutes and serve! I like to serve this soup with a wedge of lime and cilantro! Enjoy! Add two cans of undrained black beans to a food processor and pulse until thickened. Set aside. Heat oil in a large dutch oven or pot. Stir in onion and sauté for 3-4 minutes. Stir in the tomatoes, all of the black beans, chicken broth, green chilies, corn, cumin and chili powder. Bring to a simmer and cook for 10-15 minutes. If the soup is too thick add more chicken broth. If you would like it thicker puree some of the soup in a blender or food processor. Take off of the heat and stir in fresh squeeze lime juice. Serve immediately with fresh chopped cilantro for serving. Looks awesome and I plan on making it this weekend. Just one little point…the description says it’s vegetarian and the ingredients show vegetable broth, but the instructions mention chicken broth. A simple oversight, I’m sure, but you might want to fix that. I made this tonight for the second time, and I made it as per the directions. Oh my goodness, it is soooo good. My husband and I both love it, and I doubled it both times because leftovers!!!! Wow this recipe is a 10! I love black beans and the fire roasted tomatoes are wonderful with it. I also love the texture of half puree and half rinsed beans. I added a few extra spices because I always do that. And some coconut aminos because I love the flavour it gives soups. Great filling soup and great for weight watchers. In the instuctions, you say chicken broth. I acknowledge that you can use either one. I would think Vegetable would add a stronger tomato taste. I don’t have ‘fire roasted tomatoes”, would a little fire roasted paprika work?! I have not tried fire roasted paprika but you could sure try. It will most likely alter the taste. Please let me know if you decide to give it a try and how it turns out. Great Recipe. We added some left over shredded chicken and served it like a tortilla soup with tortilla chips and avocado. I thought it might be too spicy, but the kids ate it all. You could cut back on the chili powder a little if you want to make it less spicy. We made this soup to try and loved it!!!! We added some rice and for serving we added a dollop of sour cream to each bowl. Tastes great!!! We recommend trying the sour cream for!!! Thanks for a great recipe!!! I am so glad to hear! Thank you for your comment! We made this soup to try and loved it!!!! We added some rice and for serving we added a dollop of sour cream to each bowl. Tastes great!!! We recommend trying the sour cream for sure!!! Thanks for a great recipe!!! Could I substitute 1 can of garbanzo beans for one of the cans of black beans? Yes, that sounds great! Let me know how you like it that way!